The 2019 Team List is now available! See link above! Check out the race results for the 2018 event on the Results Tab. Time to start training for the 2019 race. It won’t take long getting here! Be safe on the road!!! 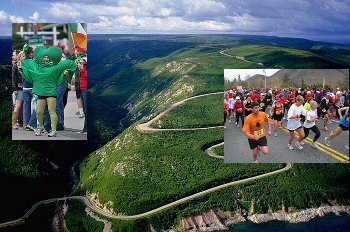 The annual Cabot Trail Relay Race is a 185 mile/276.33 km, 17 stage relay race through some of the most beautiful scenery in the world… beginning in Baddeck, Cape Breton, over steep mountains in the Cape Breton Highlands National Park, through many small communities around the famous Cabot Trail, to the gently rolling Margaree Valley.